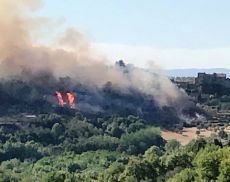 ‘Fire in Montisi, much fear and an afternoon that will de difficult to forget’ reported Montalcino News on 17th July 2017. A serious fire broke out along the Montisi bypass on the side closest to the village late in the afternoon on Monday. The cause is unknown and although many olive trees were damaged, fortunately no one was hurt. Many of the villagers helped in whatever way they could and the fire fighters and police worked tirelessly to keep the fire under control. The very windy weather conditions meant that it could have been much worse. We all hope that everyone will take great care during this long spell of very hot and dry weather so that nothing like it will happen again.